The Apple Watch is the highest-profile smartwatch yet. But rather than being crushed, it seems Apple's rivals are benefitting from the device's status. At least that's the case with Pebble. The maker of the original smartwatch saw a huge boost in crowdfunding for its latest device, the Pebble Time, shortly after Apple's headline-grabbing launch event for the Apple Watch. The day before the event, the Pebble Time was being funded at a rate of about $6,000 an hour. Very respectable. This raised to $10,000 an hour on the day of the launch, and peaked at $16,000 an hour the day after. That's an unprecedented surge in crowdfunding. 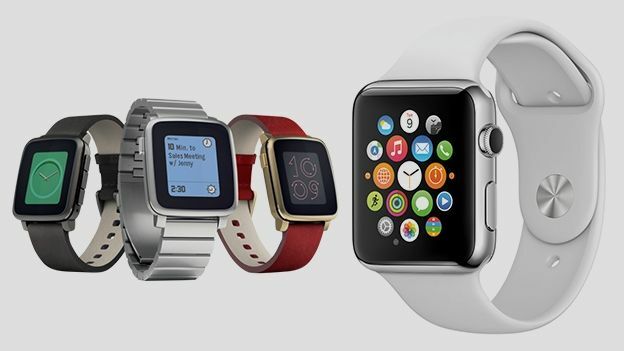 The Pebble Time and Pebble Time Steel were announced two weeks before Apple held its event. Usually, crowdfunded products reach a peak soon after being announced. Then once the hype has died down, the money dries up. Apple's event obviously raised awareness of smartwatches as a category. No doubt its Android Wear rivals will hope to see a similar surge in sales. The Pebble Time has raised almost $19 million so far, making it the highest-crowdfunded project of all time. And there are still 11 days left in the campaign. The company suspected it would benefit from Apple's first smartwatch. "Apple's event this week caused a nice spike in support for us, as anticipated," Eric Migicovsky, Pebble's CEO and founder, told TechCrunch. "When the biggest company in the world enters your market, that's the kind of validation you can only dream of. "Ultimately, the more awareness for smartwatches, and the more choice for consumers, the better for everyone. 2015 is going to be an extraordinarily exciting year." On its first day, the Apple Watch is expected to outsell every Android Wear device combined. Though one recent survey found that 69 per cent of Americans weren't interested in buying it, and about half weren't even aware of it.